Morning times go by so fast for us that I’ll hardly ever make time for a breakfast that requires more effort than microwaving, toasting, scrambling eggs, or ready-made waffle/pancake mixes… there’s my morning secret. But for this past week, I’ve been wanting to challenge my morning cooking ritual to infuse something different. 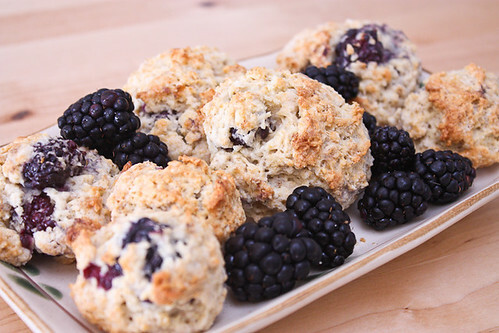 I had found a recipe entitled “The Best Blackberry Scones” and to my disappointment, it was anything but “the best”. So on my search for a better recipe, indeed I found one whose results delivered. This was also a great way to get the kids in the kitchen to help! Ice cream scoops not only help keep your hands mess-free, but it’s plenty fun for the kids also! Yes! 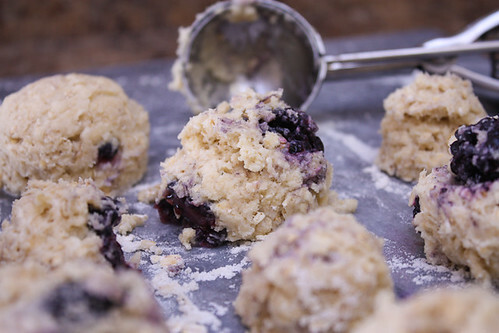 If you don’t have time in the morning, make them the night before and freeze them either on the baking sheet or in an airtight container so you just have to transfer them to the oven. Whisk together the flour, oats, sugar, baking powder, baking soda, salt and nutmeg in a large bowl. Using a box grater, quickly grate the butter until all is shredded and add to the dry ingredients, using your fingers to quickly incorporate the butter and flour mixture. If you don’t have a box grater, you can also simply cut the butter into small pieces and quickly rub the butter into the dry ingredients until it is pebbly. Still in the bowl, gently knead the dough by hand or turn it with a rubber spatula about 8 to 10 times. Turn the dough out onto a lightly floured work surface and press the dough until you have a circle that is about 1 1/2-inches thick. 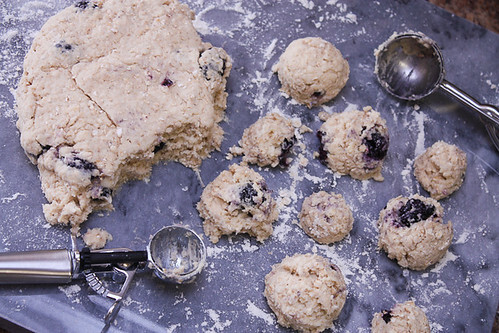 Use a 1/4 cup ice cream scoop to portion out 12 scone dough balls. At this point the scones can be frozen on the baking sheet, then wrapped airtight. Don’t defrost before baking, just add about 2 more minutes to the baking time. Mmmmm…that looks ssssoooo good. We’ll attempt this recipe when I have more time on Saturday mornings. I’m glad you finally found your scone recipe! I’m a mother of two beautiful, energetic children and wife to a hardworking, patient husband. I’m not a professional chef, but have the ambition to cook delicious meals for my family. All recipes are sourced as noted and all photos on this blog are copyrighted and may not be used unless permission has been given. Thanks for stopping by! Bon appetit!